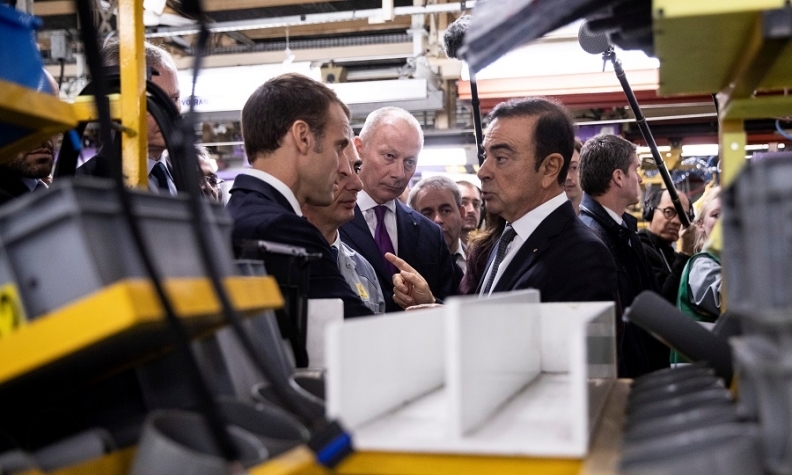 French President Emmanuel Macron talks with Ghosn during a visit to Renault's Maubeuge factory, which next year will start building Nissan small vans. In the background is Renault Deputy CEO Thierry Bollore, who is acting CEO while Ghosn remains in detention in Japan. PARIS -- An hour’s drive north of Paris along the River Seine lies Flins, home to Renault’s biggest and oldest factory, where 2,700 workers and 900 robots toil in tandem to build a steady stream of compact cars. More than half of the vehicles rolling off the line, however, don’t carry the Renault diamond badge. Instead, the factory’s most important car is the Nissan Micra, of which Flins produced 94,000 last year. The site’s shift towards the Japanese model is emblematic of Nissan’s heft in an alliance it has failed to dominate since its inception almost two decades ago. Even French President Emmanuel Macron has been drawn into photo opportunities with management to tout Nissan’s plans in France, rolling up last month at Renault's factory in Maubeuge, where the Renault Kangoo-based Nissan NV250 small van will be produced next year. Flins also is ramping up the Renault Zoe full-electric car but the small hatchback still accounts for less than a fifth of the plant's output. The French-Japanese alliance is now threatened by the downfall of the man central to the functioning of the partnership: Carlos Ghosn. On Friday, Ghosn was re-arrested on more expansive charges of corporate wrongdoing. The Nissan side has sought to harness the leadership void to address what it perceives as French favoritism by Ghosn. The French government, on the other hand, has moved to protect the pact as Renault’s biggest shareholder, saying it has helped secure business over the years, a view shared by the workers of Flins. The alliance shareholding agreement gives Renault a 43 percent stake in Nissan, while Nissan holds 15 percent of Renault, with no voting rights. The agreement also stipulates that Renault’s CEO heads the alliance. When the alliance began in 1999, Renault was about the same size but in much better shape financially than Nissan, which was on the verge of collapse. Fast forward two decades, and Nissan overshadows its French partner with almost twice the revenue and a larger profit contribution. Ghosn is unlikely to re-emerge in public anytime soon. He has already spent a month in jail in Tokyo, and the latest set of charges accuse Ghosn of inflicting financial damage to Nissan from his own unprofitable investments. Ghosn’s lawyers declined to comment, and the French government has not responded to the latest developments. While Renault has undoubtedly benefited from the alliance, workers in Flins don’t necessarily share the view that Nissan has propped up its partner, or that Ghosn -- a globalist with roots in Brazil, France and Lebanon -- is partial to Paris. On the contrary, the view in Flins is that Nissan has launched cars with fresher designs and hot-selling crossover vehicles such as the Juke and the Qashqai, something that Renault required years to replicate. Nissan also has pushed into the important Chinese market on Ghosn’s watch, while Renault has little presence there. Nissan and the Micra hatchback, first launched in 1982, are key to keeping Flins humming along. 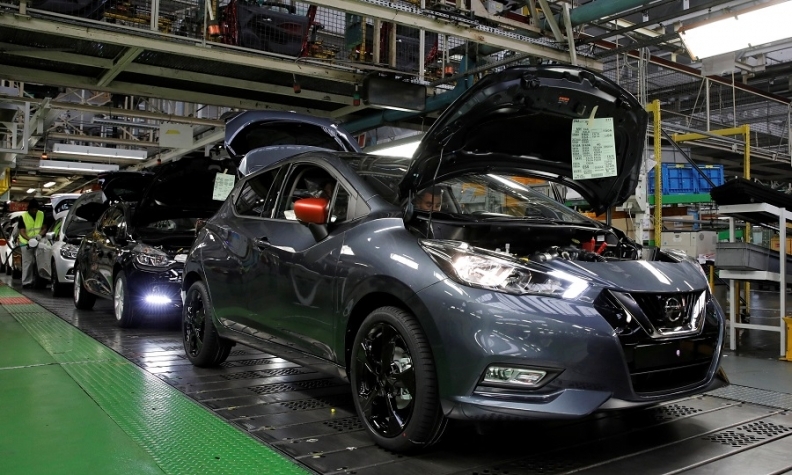 Less than a decade ago, it looked as if building the Micra in Western Europe was too costly: Nissan moved production from Sunderland in the UK to a Renault factory in Chennai, India. But quality issues and the distance from key European market led Nissan to relocate the Micra once more, this time to Flins. There were also more synergies with Renault’s Clio, France’s bestselling car this year that’s also built in Flins and has the same engine transmission as the Micra. It’s a complex work web that highlights the intertwined relationship between Renault and Nissan.